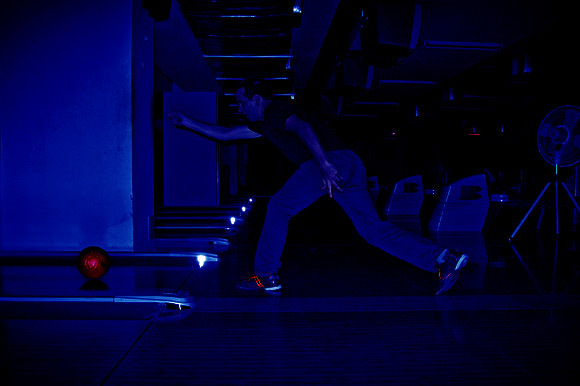 Yesterday night the mood was right for a little bowling. I invited a group of people to vegetarian dinner and tournament. One girl was Thai and had never played before. She feared that her fingers would get stuck in the ball as it carried her down the lane. The French couple had played before. For J. and I, it had been over a year since we last black-balled it. 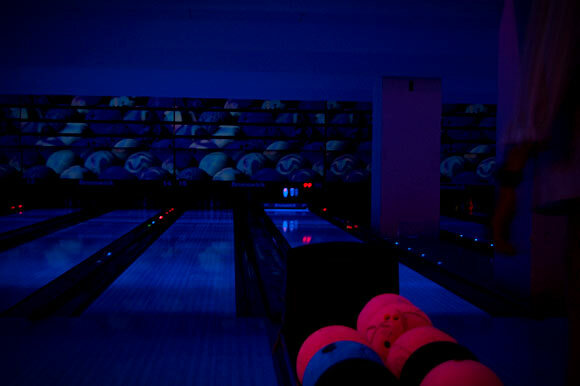 Our lanes of choice were Bully Bowl, spread over a 4th floor corner of Kad Suan Kaew Complex on Huay Kaew Road. When we got to the mall around 9:30PM, the front steps were swarming with a few hundred attentive soccer fans. The match ended with cheers. One half of the bowling facility was closed. Peering in the window revealed a dusty, darkened set of abandoned lanes. These must be the spirit lanes. Outside the door, teens were practicing pop dance. All over the mall it appeared that there was going to be a dance contest. The Sizzler team was rehearsing next to the restaurant. Down by the elevators, the Dairy Queen dancers were sizing the competition. 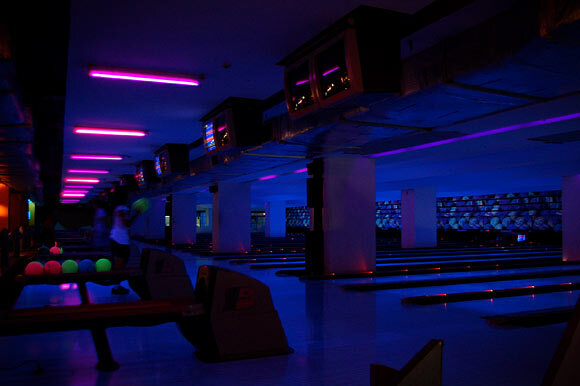 Bully Bowl lanes are in perpetual neon party mode, even during the day. But on weekend nights, they stay open until 1AM and have a live DJ. There was only one other group bowling that evening. The DJ was having a ball despite the empty lanes. He spun and smiled. He was right behind us. E. throwing her first ball. 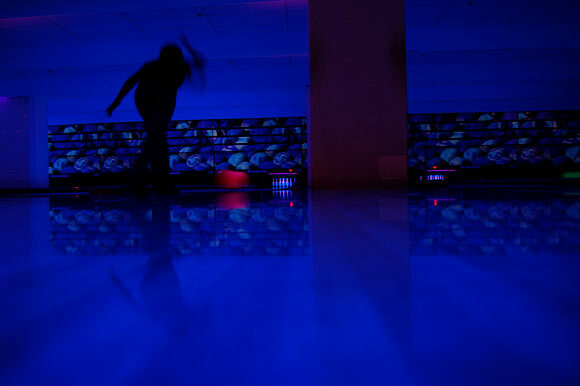 The lanes were clean but haywire. Our monitor flickered on and off. The pin setting apparatus would jam and occasionally drop pins. The balls had dings and chips missing. It was not a precise game, but it felt perfectly Thai. The place was overstaffed with enthusiastic youth. As soon as there was a problem with the lane, they would pop up to fix it. 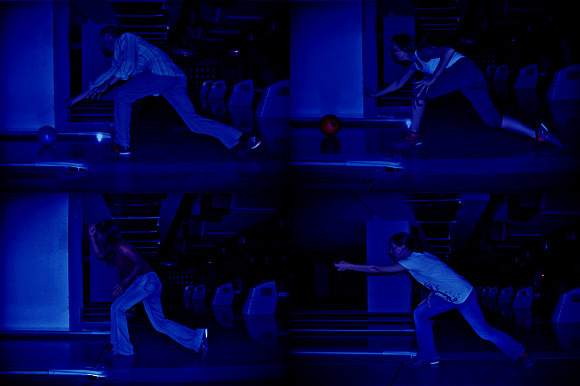 Everyone else bowling. We all seemed to have the same form. We played two games each. I sucked more than I’ve ever sucked before. I wanted to play a third game, but most of the group was getting tired. I picked up the tab. For 5 people, two games each, five pairs of shoes, and a pair of socks our total came to 540bht($16). Pretty fair by any standards. Once again Thailand surprised and delighted the Cheap Lebowski. If only I’d know about these lanes earlier.